If you haven't heard already my family and I are moving to Qatar (note the wikipedia entry needs some clean-up) in August to start the school year as teachers at Qatar Academy (QA). This week however the school flew me in to train on the new Chancery school management system so I have had a unique opportunity to get to know some of my new colleagues and to become familiar with Qatar before we all arrive next year! Having just come from colourful and humid Bangladesh I was immediately struck by the dryness of the heat and the colourless surroundings. I do not mind the heat (40+ C) as ALL venues and cars have excellent air con (too cold in fact!) so it is good to get out into the warmth for a few minutes. I have even got used to the lack of colour, the open expanses of rubbly desert, the dusty palm trees and the copious construction work. 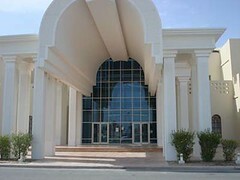 Qatar Academy is a magnificent school. It exists under the umbrella of the Qatar Foundation (QF). On the enormous QF campus there is the 1500-student Pre 3-12 Academy as well as tertiary institutions, accommodation, enormous recreation centre and other facilities (even a Starbucks coffee shop!!). I will not go into full detail today as my head is spinning from this intense training (5 days in the same room with the same people....) but I will just say that I am really looking forward to being here next year. Educationally QA is a fully accredited International Baccalaureate school with all three programs (PYP, MYP and Diploma). My position will that of Head of IT across both Primary and Secondary schools. The school is just ripe for some serious exposure to e-learning and Web 2.0....but it is going to be a challenge as IT skills and knowledge seem to be a little low. I was getting quite blank looks from other teachers when I mentioned blogging, wikis, RSS, social bookmarking.......but the good news is there seems to be a bit of money to spend (they are one of the top 5 wealthiest countries in the world) and a receptive attitude towards change and progress. Yes, I know only people who have lived in Bangladesh for 4 years actually take pictures of inside a shopping centre ;-). But this one is extra special. The façade is of a street and there is a sky and a glow that makes you think you are outside or on a movie set. There is even a canal running through it! Beautiful shops and restaurants and department stores....including....wait for it....a Virgin Megastore!!!! with books at US prices and a whole range of electrical items at reasonable prices!! Here are more pics from Qatar on a flickr slideshow. I lived in Abu Dhabi for two years and one of my first impressions was about the lack of colour under the raging desert sun. Beautiful people, wonderful food (yum! ), and great flickr pics. Thanks for sharing. Julie, welcome to the IBAEM region! We traveled from Turkey to Doha one winter to spend the holidays with relatives in the petroleum industry. 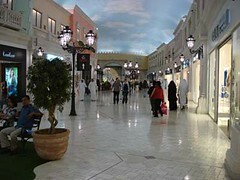 Qatar's one of the more relaxed places in the Gulf for foreigners, good restaurants & shopping (I remember that mall!). We went off-roading in the desert using the GPS (typical geologist hobby I guess) and found lots of cool rocks & fossils. Hope you enjoy your time there!